November is here! And so is the Haymeadow Calendar of Events! 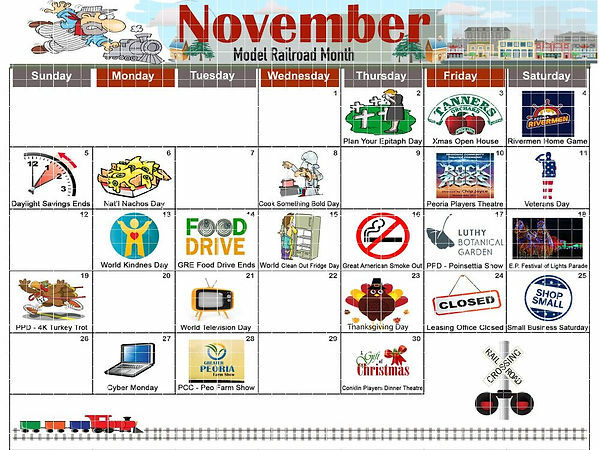 This month is Model Railroad Month, and brings with it colder temperatures and Thanksgiving Day! As always, we have highlighted local events, national holidays, and the "off-beat" holidays too! It&apos;s a busy month with our Thanksgiving Food Drive, the Thanksgiving holiday and Black Friday (when our office is closed). Have a great November, residents! Don&apos;t forget to let us know if there are dates you&apos;d like to see included on future calendars. Just drop an email to Marketing@GRErentals.com!Thank you for reading!